The D.C. area is once again getting hit with heavy rains and threats of flooding. A flash flood watch has been issued for parts of the area that extends until 5 a.m. Monday. WASHINGTON — Showers, storms and possible flooding are all in the forecast for the D.C. area on Sunday and into Monday morning. The National Weather Service has issued a flash flood watch for parts of the D.C. area that will be in effect until 5 a.m. on Monday. The weather service said multiple rounds of showers and thunderstorms are expected on Sunday afternoon into Sunday night that could produce 1 to 3 inches of rain on average. Some areas might see higher amounts. And in Howard County, where flooding devastated Ellicott City weeks ago, officials are taking proper precautions ahead of the heavy rain and lightning expected in the county around 4 p.m. Howard County officials have paused cleanup efforts and credentialing. Rickets said thunderstorms containing heavy rain should be expected through the overnight hours on Sunday into Monday. A flash flood watch means that conditions may develop that lead to flash flooding, which is a very dangerous situation. 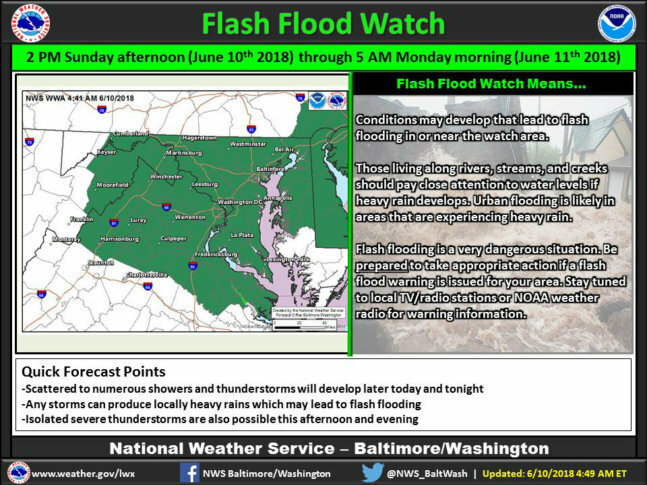 Previously, the National Weather Service had issued the flash flood watch for the most of the D.C. area, but the watch was cancelled for D.C., Virginia and parts of Maryland just after 2 a.m. The weather service said on average rainfall amounts from 1 to 3 inches are expected, though some areas could see higher amounts. Temperatures peaked around 80 on Sunday. You can expect showers and storms with heavy rain through much of Sunday afternoon into the overnight. Highs will be in the 60s on Sunday night. On Monday, the humidity will decrease with highs near 70 as showers continue. The humidity returns on Tuesday. Highs will be in the lower to mid 70s, there could be a few showers but skies will be partly sunny. Things get warmer on Wednesday with highs in the mid 80s. Wednesday will be more humid and there is a chance for storms. The rain could lead to slick roads, which could cause a lot of traffic headaches around the region.